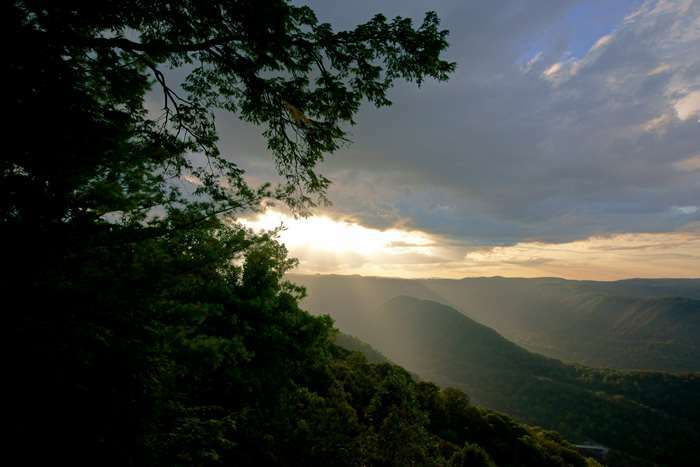 West Virginia’s mountains are amazingly beautiful, but to appreciate them, you need a good viewpoint. And you won’t find a better one than at Grandview Park. 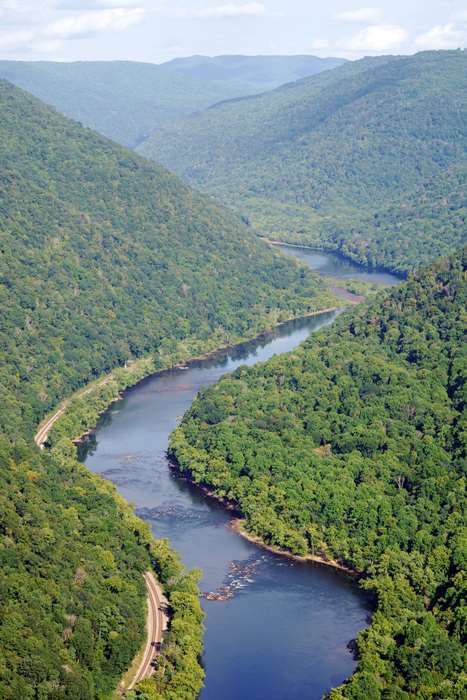 This former state park is now in the National Park Service system, as part of the New River Gorge National River. It’s one of the few places in the park where, instead of accessing the river directly, you have a sweeping view of it from above — especially from the outstanding Turkey Spur overlook. Grandview Park also offers some fun hiking trails, and it’s home to an outdoor amphitheater. 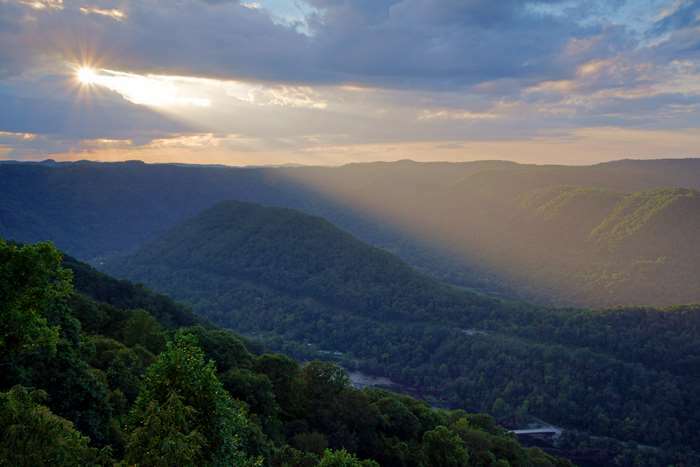 Grandview Park is located near Beckley, West Virginia, off of Interstate 64. Take I-64 exit 129 and follow County Route 9 north into the park. Note that on a map, Grandview appears to be very close to WV 41, Glade Creek Road, and the towns of Prince and Quinnimont. However, Grandview is at the top of the hill, while those roads and towns are at river-level. There is no direct connection between them (aside from the Little Laurel hiking trail). To access the viewpoints at Turkey Spur, follow signs in the park towards Turkey Spur, then park at the end of the road. … and you can look up the valley at the blue river and all those green leaves. Just imagine this view in the fall, when those trees turn! The peak of fall color at Grandview Park is usually around the third week of October, but the color comes and goes quickly. Several hiking trails begin near the main overlook. I spent some time hiking the Castle Rock Trail the following morning. From the main overlook, backtrack to the park entrance road, then follow signs for Turkey Spur (you’ll need to make a left, making it feel like you’re taking a side road, but you’re really heading out to the farthest point in the park). Once you reach Turkey Spur, the road abruptly ends at a tiny parking lot. On both sides of the parking lot, you have a view of the river — which should be a clue that you’re on a very narrow ridge, near a very sharp bend in the New River. At the parking area, you’ll see a trail that takes you along the side of the cliffs. 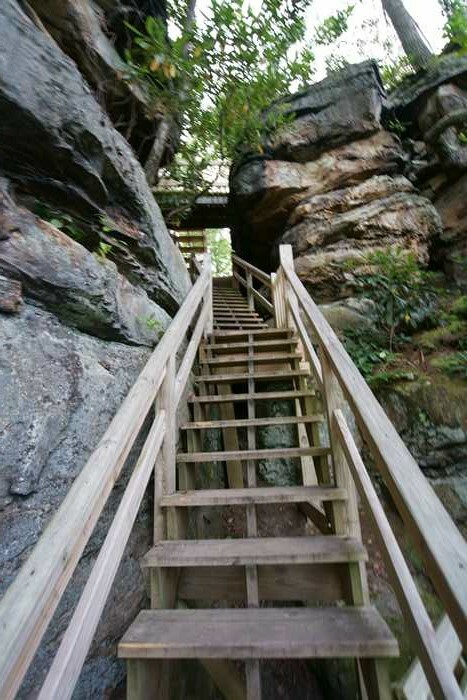 In a short distance, it arrives at these stairs, which climb through a gap in the rocks up to the very top of the ridge. From there, the boardwalk branches out in a couple of directions, leading to several viewpoints. As an alternative, you can take the Grandview Rim Trail (formerly the Canyon Rim Trail) back towards the Main Viewpoint. It follows the road at times and plunges into the forest in other spots. The only downside to this trail is that you’ll need to hike back to your starting point or have someone pick you up at the other end. The view looking north from Turkey Spur looks towards WV Route 41, Stanaford Road, near the Amtrak station at Prince, West Virginia. This view has changed since the last time I was here. 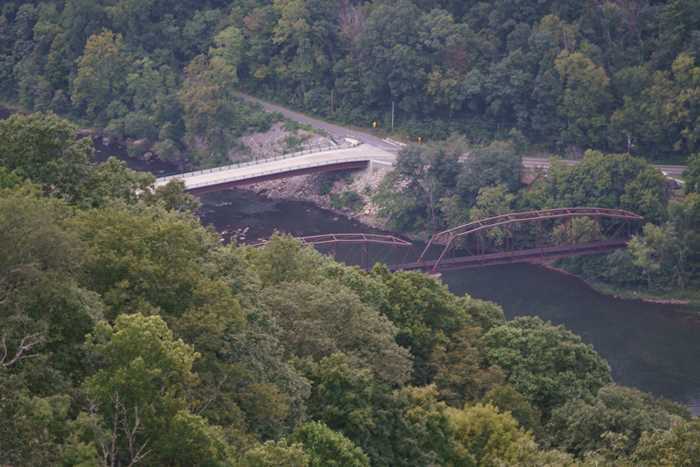 The Route 41 bridge used to be an old through-truss structure, similar to the railroad bridge. Now, the old highway bridge has been replaced with an ugly new concrete structure. I’m sure it’s a functional upgrade to the old bridge, but the gleaming white concrete stands out in every photo you take, looking like a mistake. It’s too bad they couldn’t have made the new bridge look more like the old one. The Register-Herald has video of the old bridge being demolished. Documentation on Historicbridges.org shows that it would have been 4 million dollars cheaper to reconstruct the old bridge than to build that ugly concrete slab. The drawback, though, is that the bridge would have to be closed to traffic for two years during that construction. I wonder if they ever considered the option of building a new bridge that looked like the old bridge? In a state full of mountains, you’d think it would be easy to find a place with a great view where you could watch the sun set. But it turns out, it’s trickier than you’d expect. Even here, in Grandview, where the views are certainly grand, the sunset views aren’t all that great. None of the overlooks have a western view. In order to get a good look at the sunset from Turkey Spur, I had to hop a fence and climb out to the edge of a cliff. I’m not complaining, though. It’s a beautiful view. At least it will be, once I Photoshop-out that concrete slab down below. As you look towards the horizon here, or in most places around southern West Virginia, you don’t see a lot of layered mountains (like you might expect out west, or even in the Smoky Mountains). Most of the lumpy landscape in the Mountain State tops out at roughly the same elevation, so the horizon isn’t very dramatic. But those clouds were pretty great. 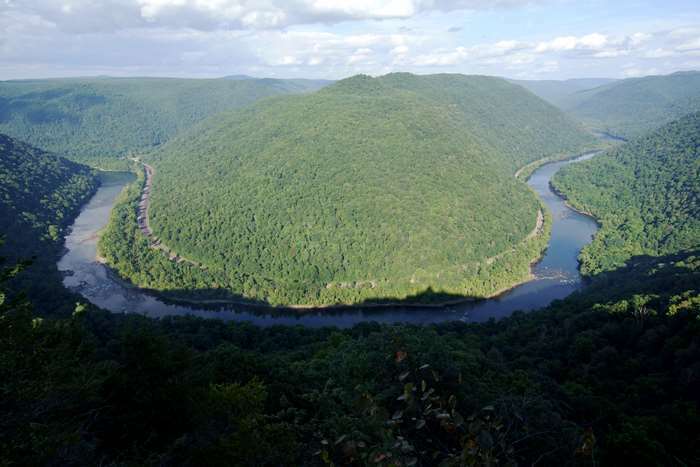 Grandview Park should be high on your list of places to visit in southern West Virginia. 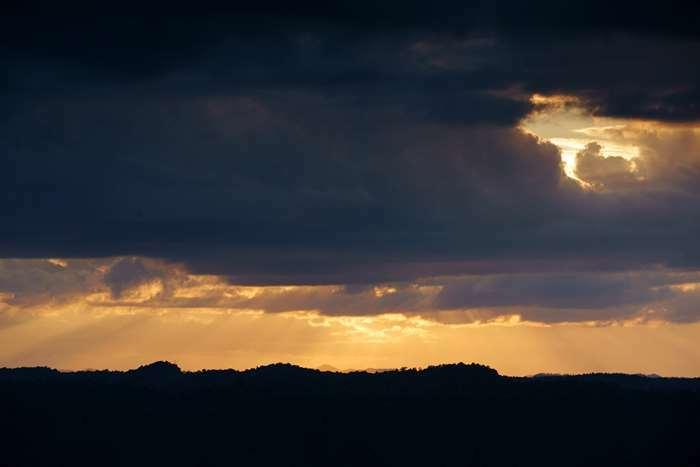 It offers some of the best views of the mountains that you’ll find anywhere, along with some easy hiking trails.